The history of steam baths and saunas is ancient, be it the bone dry Finnish Saunas used as far back as 2000 years ago or the steaming Turkish Hammams and Indian Swedanas. Used for cleanliness, sauna relaxation, socialising or for religious rituals, these heat fuelled rooms still are widely used around the world. Steam rooms and saunas often become confused, there is however, one simple difference; Saunas work using dry heat and steam rooms using wet. There are a few more technical differences but this is the essential division between the two. Both types of room are often regarded as a welcome and peaceful retreat from a hectic schedule. External steam generator Internal generator. 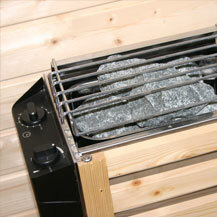 e.g., stove or heating elements. Hopefully, you should now be feeling more confident on the intricacies of these heated retreats. Both steam rooms and saunas are excellent places in which to relax and both have many recognised health benefits. According to Alan Sanderfoot the sauna and steam room remove toxins from the body through perspiration, aid relaxation of tense muscles, relieve pain and stimulate blood circulation. These coupled with some time away from the stresses and strains of daily life suggest that both can facilitate a happy and healthy mind and body. In addition to either the dry or wet atmosphere, aromatherapy oils can be released into the air or steam to further promote a relaxing haven. There is a vast array of shapes and styles of saunas and steam rooms. Some saunas can be constructed outside the house, others can be smaller wooden units for inside the house - some as small as a conventional shower enclosure. 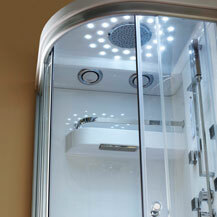 Similarly with steam rooms, these can be constructed as large enclosures outside or inside of the home. Again, they can be incorporated into a steam shower unit which provides all the benefits of a steam room but without losing any additional space! In essence, the choice between steam or sauna is a personal one. Whichever type of heat appeals, be it wet or dry, either sauna or steam room can be a real asset to your lifestyle and give your body and mind regular time to unwind and detox. Note: Di Vapor is not responsible for the views, opinions or advice represented in the articles on this site. You are advised to seek medical advice before following any such information. Copyright © 2008 Di Vapor.